Urethane bead blast mask set. Designed and cast by United to customer's requirements. Depicts the master model and resultant mold made from it. 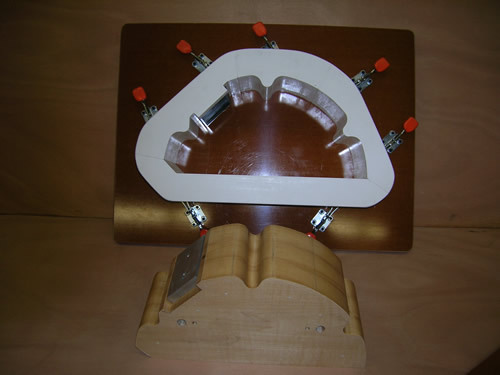 A completed mold designed and fabricated by United Industries. 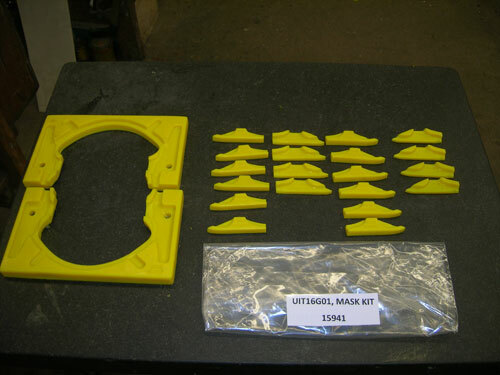 United Industries excels at making molds for casting plastic or metal parts. 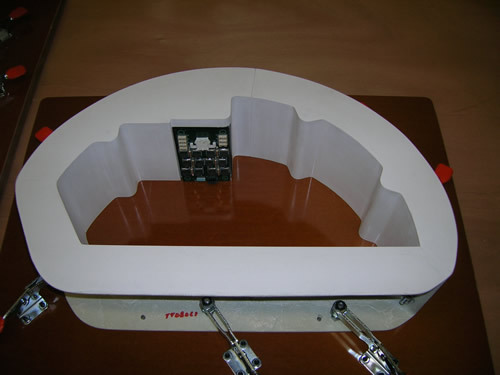 All of our molds are made to special order to meet individual customer requirements. Molds can be made of rigid materials such as plastic resin or pliable materials such as silicone rubber. The mold material selected is based on factors such as the model material and desired casting material as well as other considerations. We will use our expert mold making knowledge to help you select the perfect mold materials for your project. Plastic Molds - We excel at making molds from plastics such as: Cast Urethanes, Epoxy Resins, and Silicone Rubber. Plastic molds are perfect for short production runs. Metal Molds - Molds can also be made from metal such as Aluminum or Kirksite. Metals molds are more dimensionally stable and durable and are generally used for repetitive casting. Sand Molds - We produce our metal castings using sand molds in which sand is used as the mold material. Sand molds provide a cost effective solution for producing tooling for formed metal components. Casting parts from a mold is a production method often used for complex shaped parts that would be too expensive to produce using other methods. United Industries can cast either plastic or metal parts. We excel in producing short runs of custom plastic castings requiring special care and craftsmanship. Casting Materials Selections: Choose from Metals, Plastics, Urethanes, Epoxy Laminates, Epoxy Resins, and Silicone Rubber. Save a Step: Usable parts can be made directly from your electronic files, saving you time & expense of unneeded steps. Castings Save Money: The next time you need a complex machined part, consider having it cast. Casting is especially cost-effective when multiple parts are needed. Castings are easy to make and are available in both metals & plastics. Of course, we can machine parts too!